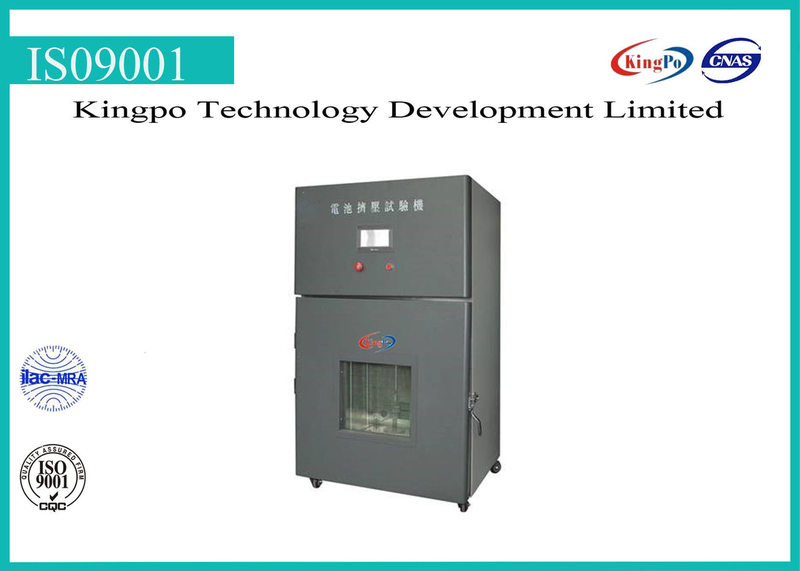 This device is a new test chamber combined with temperature test chamber and crush test chamber. This device is design and manufactured accord to international standards UN38.3, IEC62133, IEC60086-4 etc., can simulate a temperature test environment, can also monitor detect the test result under this environment. It is a good choice for battery, capacitors, electronic products simulate test equipment. Suggest installing this equipment on a flat and stable ground or platform, in an environment of room temperature with 380V 50Hz power supply, and keep 1000mm away from other equipment and wall as below. We can set test parameters as required, set acquisition frequency, stop mode, starting mode etc. Temperature is to be controlled on touchscreen. Can modify and monitor the temperature in monitoring interface on touchscreen. Input required value and save. The chamber will run automatically. 1) This equipment should be placed on level ground or platform, in an environment of room temperature 25±10℃, humidity 50±30%RH. 2) Keep this equipment away from heat or corrosion source. 3) Lock two front wheels when equipment in location. 4) For safety, conduct test with viewing door opened is forbidden. And if not necessary, do not observe test in front of viewing window. 5) Clean: before and after each test clean the chamber outside and inside with clean cotton cloth to keep the instrument neat. 6) Rustproof: Check weather the instrument active parts are functioning properly, put butter on fix rod after each test to keep it work smoothly. Spray anti-rust oil on coating plate and steel structure to proof rusting. 7) Turn power off: turn power off after test; suggest on-power once a month if it will not be used for a long time. 8) If battery on fire or smoke, please exhaust the gas outdoor on time.